Paleontologists have finally named the famous 'Baby Louie' dinosaur fossil, and they report today it is a new bird-like species. Beibeilong sinensis, for "baby dragon from China," may have been common on Earth about 90 million years ago, the researchers say. Why it matters: The fossil of the embryo was found in an egg in China's Henan province more than 20 years ago, but until now, scientists didn't know what dinosaur was within the egg. Some speculated they were from a Tyrannosaurus rex because of their size, roughly 17.5 inches long and 11 pounds, and other fossils found in the area. Others thought it could be Gigantoraptor. When they examined the fossil, they found it came from a close relative of Gigantoraptor. Interesting backstory: Thousands of dinosaur eggs were found in China's Henan province in the late 1980s and early 1990s, but many were sold, including the one in the study that was imported to the U.S. by a private collector. When it was prepared, it revealed a nearly complete embryo of a skeleton. But professional paleontologists wouldn't risk their reputation publishing about a fossil that had been removed from its home country. Several scientists viewed it in private and when it was on display at the Indianapolis Children's Museum, but it wasn't until it was repatriated to China in 2013 that researchers were able to thoroughly examine it. Burning question, via paleontologist James Clark: Why are there so many eggs and so few adults? 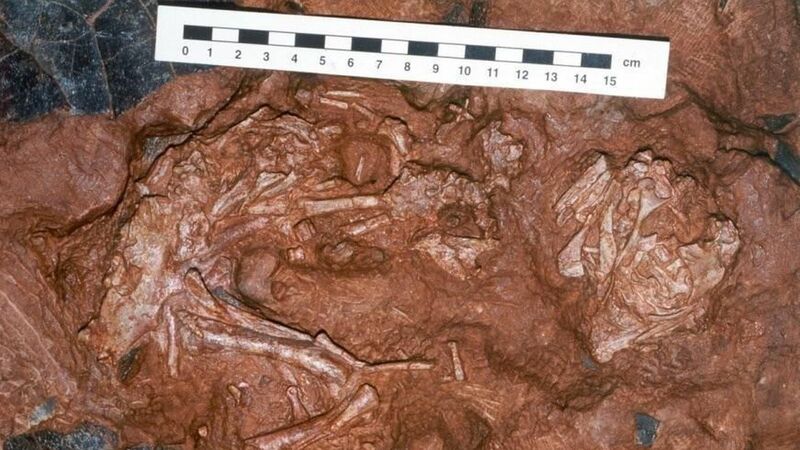 Baby Louie's egg came from a partial nest of at least six others and although other eggs have been discovered, very few bones of giant oviraptorosaur adults have been found.